MissDial has always tried to catch up with latest trends and upcoming technologies in the market. We really got excited when we saw gmail and facebook giving notifications to our desktop even when we are busy working on other tab or even different window. Our team started to research more on it and though it took us a bit longer to develop this unique functionality, but we are really happy that we finally did this, and the feedback received by some of our users is awesome. As we had already made the announcement(in our Trigger section) so there were a lot of users who gave there valuable feedback and requests for a few enhancements, without which the feature could not have been so exciting. As a token of thanks MissDial gave them early access to this feature and we are really thankful to them for their valuable advise and experience they shared with us. We are expecting more feedback from more of our customers, and as earlier we shall always remain evolving our platform and features, based on your feedback. One of our user mis-understood our announcement and thought we shall be giving push notifications on mobile devices, which initially we did not thought of. Our team took this as a feature request and now we can proudly say, our Push notifications can notify you of Missed calls even on your mobile devices and tabs. Enabling push notifications on MissDial is easy and takes less than 10 seconds to configure. 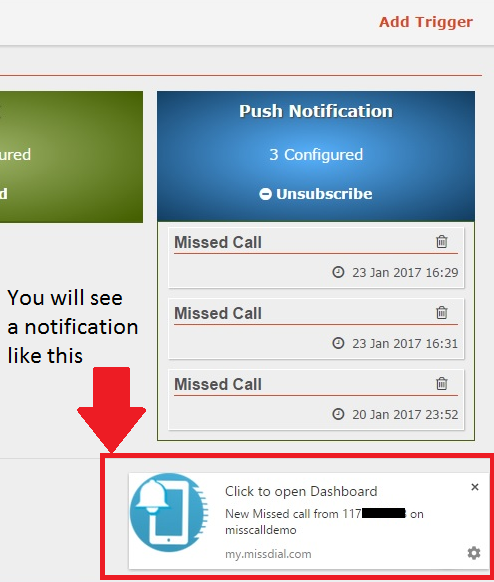 How to enable Push Notifications on MissDial?